Technicial difficulties with BepiColombo, a joint project between Europe and Japan, will push back its launch to Mercury by 13 months until August 2015, but officials do not expect the postponement to trigger another increase in the mission's budget. 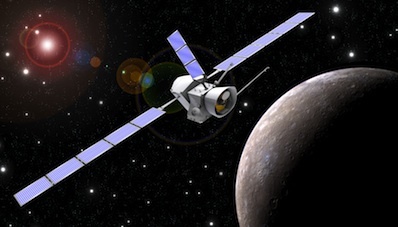 Launch was set for July 2014, but development and testing of the mission's electric propulsion thrusters, solar arrays, antennas and thermal control system is taking longer than expected, according to Jan van Casteren, Europe's BepiColombo project manager. "Much of the equipment is specially developed for this mission and is critical in view of its intended operation at high solar intensity and high temperatures," van Casteran said in an email to Spaceflight Now. The challenges forced European officials to push back the mission's departure to the next launch opportunity, when the planets in the inner solar system are positioned to permit BepiColombo's circuitous route to Mercury. The new schedule calls for launch around Aug. 15, 2015. BepiColombo will fly by Earth a year later, followed by two closes passes near Venus and four approaches of Mercury. The flybys will use each planet's gravity to slingshot the spacecraft closer to the sun, eventually allowing BepiColombo to enter orbit around Mercury in January 2022. BepiColombo's previous arrival date at Mercury was in November 2020. The mission consists of two orbiters, which will blast off together on an Ariane 5 rocket. A planetary orbiter provided by the European Space Agency and a Mercury magnetospheric probe built in Japan will cruise to the solar system's mysterious innermost planet with a sunshield and a solar electric propulsion module, which will be jettisoned after the craft enters orbit. The European and Japanese satellites will separate to study Mercury from different orbits, observing the planet's cratered surface, investigating its origin, probing its interior, examining its tenuous atmosphere, studying its magnetic field, and timing Mercury's orbit around the sun to test Albert Einstein's theory of general relativity. The BepiColombo mission, which narrowly escaped a cancellation vote in 2008, has an ESA budget of 970 million euros, or nearly $1.3 billion. Other European institutions are developing instruments for BepiColombo's planetary orbiter, a contribution worth more than 200 million euros. Coupled with the Japan Aerospace Exploration Agency's investment, which approaches $200 million, the mission's total cost is more than $1.7 billion. ESA's budget included a contingency to cover a launch delay, van Casteran said, meaning BepiColombo should not need additional funds to account for the 13-month slip. BepiColombo's cost has grown 50 percent since the mission was first approved, mostly because European officials misjudged the mission's stringent test requirements and mass. The mission's mass grew too large for the spacecraft to be lifted into space by a Russian Soyuz rocket, compelling managers to select a larger, more expensive Ariane 5 launcher to dispatch the 9,000-pound dual-satellite mission. During its mission, BepiColombo will endure temperatures greater than 660 degrees Fahrenheit. 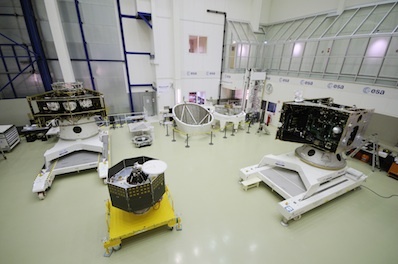 Structural models of BepiColombo's European-built planetary orbiter, Japanese magnetospheric probe and a sunshield were subjected to intense thermal testing and blasts of ultraviolet light to ensure they will survive in orbit around the solar system's scorching innermost world. According to van Casteran, BepiColombo's solar arrays, antennas and thermal control system are fully exposed to heat and solar radiation at Mercury, which is about 10 times the solar constant at Earth. A space simulation chamber at ESA's space research and technology center, or ESTEC, in the Netherlands was modified to test the BepiColombo spacecraft in such extreme conditions. Engineers must run UV lamps at full power and focus their light on the spacecraft with mirrors to mimic conditions at Mercury. A model of BepiColombo's combined configuration, in which it will fly to Mercury, will enter vibration and acoustic testing this spring, and officials hope to complete the environmental testing by July. 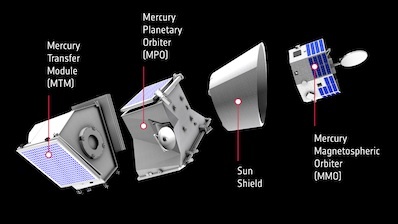 BepiColombo would mark the first European and Japanese probes to Mercury, and the mission would be the second to orbit the planet after NASA's MESSENGER spacecraft, which entered Mercury orbit in 2011.